There is no hiding in that floor mats are great when it comes to creating a safer workspace. It is of the utmost significance that well maintained mats prevent possible trips and slips. It’s important both for customers and employees. The right mat plays a big role in preventing employees from fatigue and muscle strain. How To Choose The Right Mat For Your Workplace? Non slip mats have a very different purpose than anti fatigue mats. The choice between these two depends on the business type and the nature of your work. They also significantly contribute to worker safety in such types of work environments. Anti fatigue mats are perfect for reduction of foot weariness. It is especially good for workers who stand in one position for a large period of time or for a whole day. 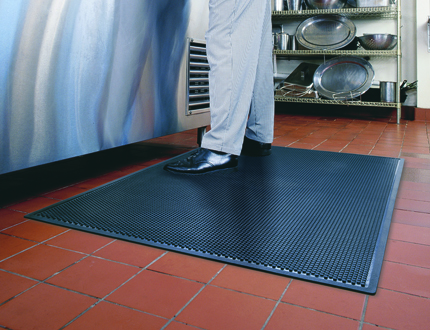 Anti fatigue mats absorb the impact on feet due to walking. They provide a cushioning effect that decreases foot fatigue. Be careful with non slip matting, because it can increase foot fatigue. Non slip matting is “grabbing” the shoe soles, which makes feet move forward in the shoe. It’s of great importance to choose the right type of mat suits for the particular situation. Some workplaces benefit from both types of the mats. On the other hand, some other places require only one type of mat. Would you like to ensure that your workplace is at its safest as it’ can be? If yes, then it would make sense to get some expert advice on what type of mats is suitable for your situation. Consider trying a mat rental service. Our service provides regular pick-up and exchange. It also makes sure that the mats in your work space are always clean and in good condition. It’s very important when your previous mats become worn out and trip hazardous. A clean workplace will contribute both to employees and customers. It will leave a very good impression on everyone. Our Wet Area Mats and Anti-Fatigue Mats are all made out of recycled eco-friendly materials. Just think about how much you will benefit from this. The only thing you have to do is call Alsco and we’ll be very pleased to serve you.